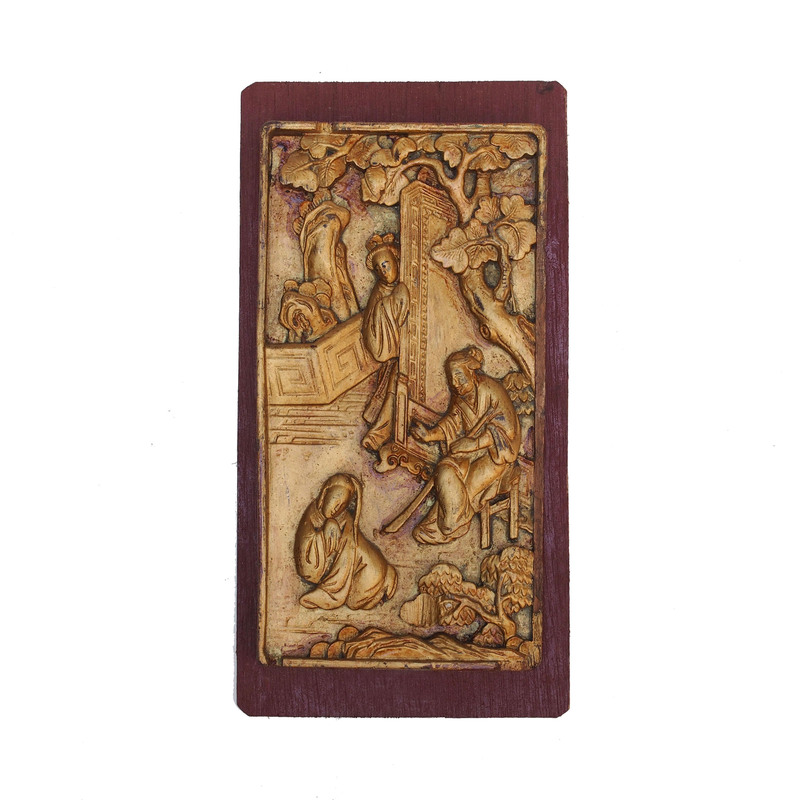 A golden lacquered wood carving of the blessed symbols. 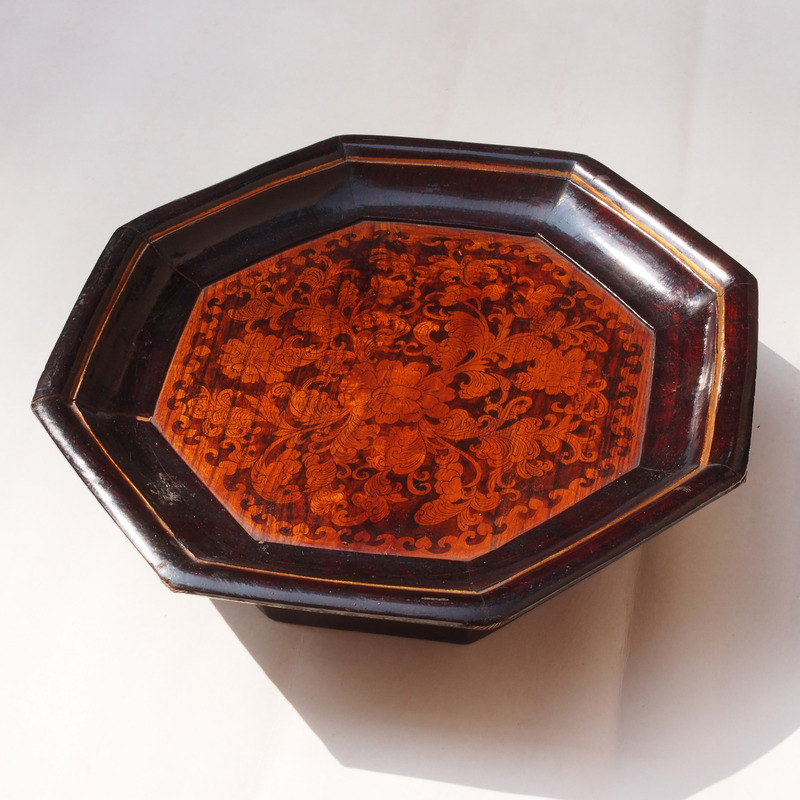 The dish is decorated with peony flowers, peony is also know as the flower of riches and honour 富貴花. There is a story about peony and the mean Empress Wu Zetian, one snowy winter she summoned all the flowers to blossom for her morning wine party. The gardeners as well as the plants did their best, going against the natural order they all blossomed in fear of the Empress, all but the peony. The Empress was extremely upset and forbid peony to stayed in the capital Chang An, it was send to Luoyang. There in Luoyang, the peony blossoms filled the city. When the Empress heard about the news, she ordered for the peony to be burnt, but under the warm of the heat, it blossomed even more. Click for more information about the special construction of the dish. 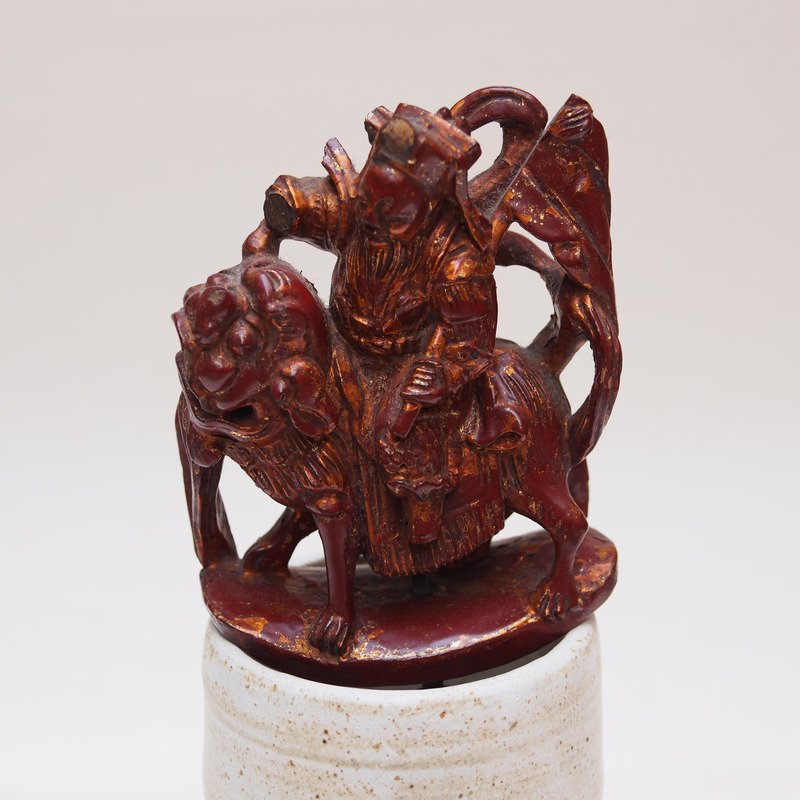 This lion riding figue is Wei Chi Gong, a general of the Tang dynasty. 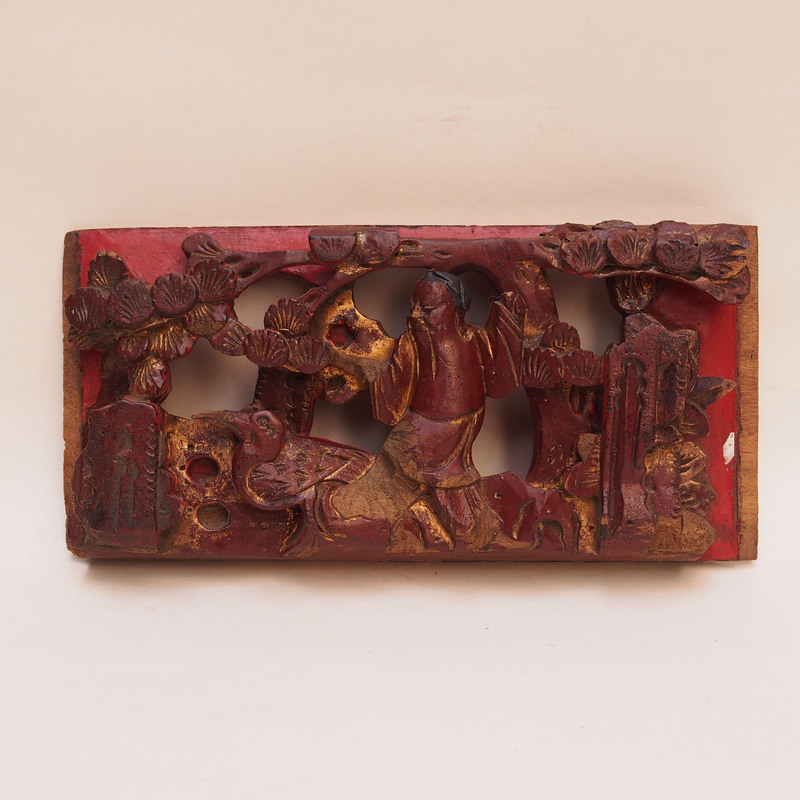 Stories of his loyalty and bravery made it to the hearts of the people that he became a protector for the home, prints and figurines were made of him and his partner Qin Qiong. 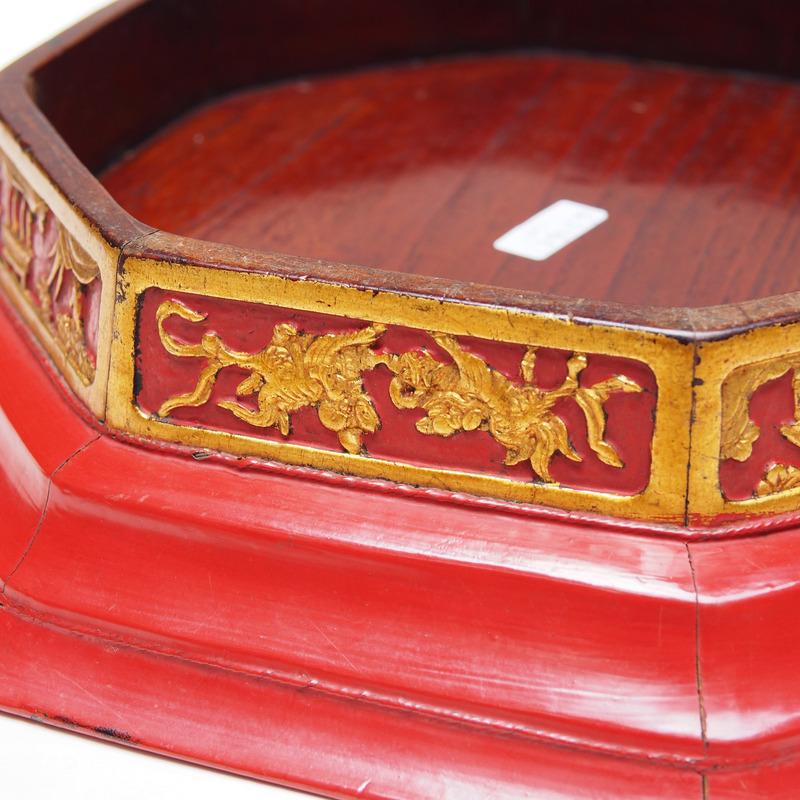 Legends has it that in the Tang dynasty, the Dragon King had a bet with a fortune teller, this act violated the rules of the heaven and Jade Emperor ordered for the dragon’s execution. The Dragon King pledged with the Tang Emperor and the Emperor agreed to summon the executioner back to court so the dragon could be spare. Unfortunately, the Emperor doses off and missed the hour, the dragon was cut in half and died. 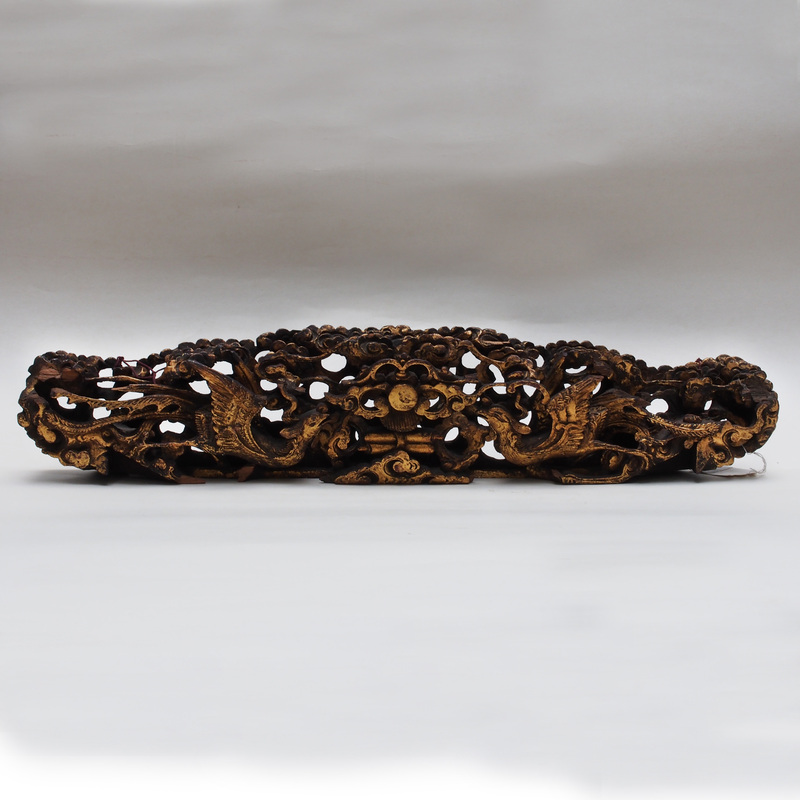 The dragon was extremely upset that the promise was broken and its ghost haunted the imperial palace day and night. Wei Chi Gong and Qin Qiong, the two brave generals offered to stand guard at the door of the palace, the dragon ghost was kept at bay. The emperor felt guilty that the pair has to be on guard days and nights because of his own negligence and ordered prints and figurines to be made of the two so to spare them from their task. The fame of the two generals is so powerful that their imagery would be enough to scare away the haunted dragon, since then they were used to guard doors, gateways, bed in the household. 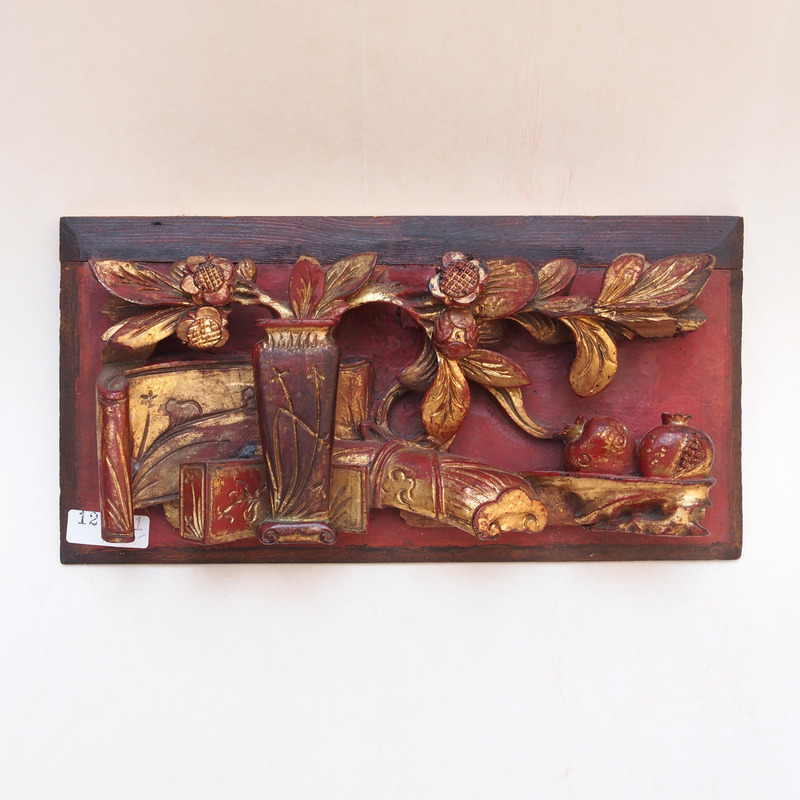 This wood carving would have been the center piece of a furniture. A pair of phoenix amidst an intricate carving of clouds are flying towards the raising sun. The phoenix is a pair of mythical birds that symbolizes peace. These king of birds flying towards the sun represent an expectation of well being to come; a blessing of health, longevity and goodness. 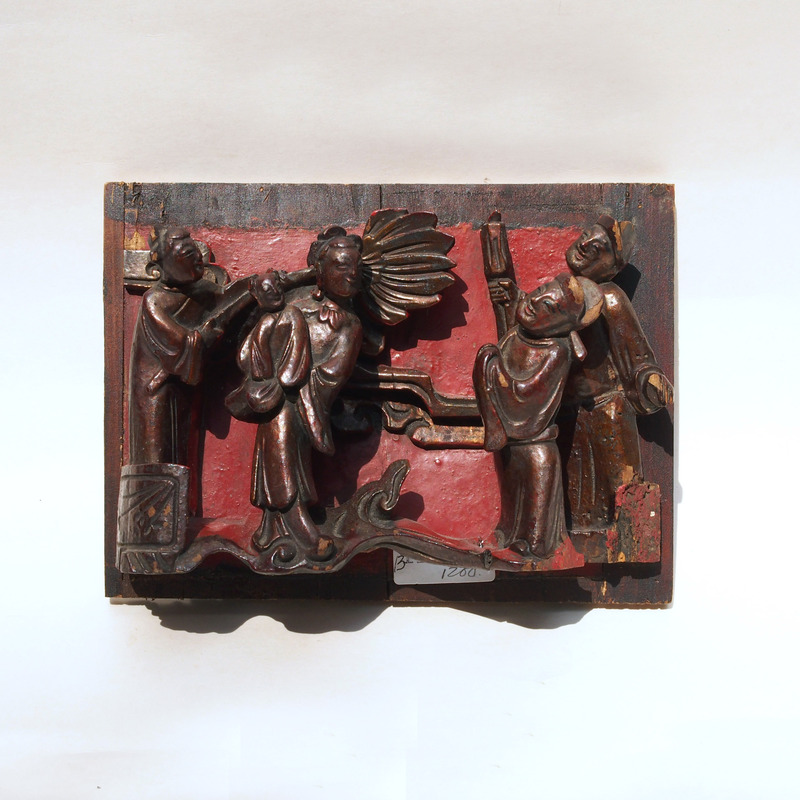 “Child from the Saints” is a popular blessing subject in the Ming and Qing period, symbolizing blessing and fertility. 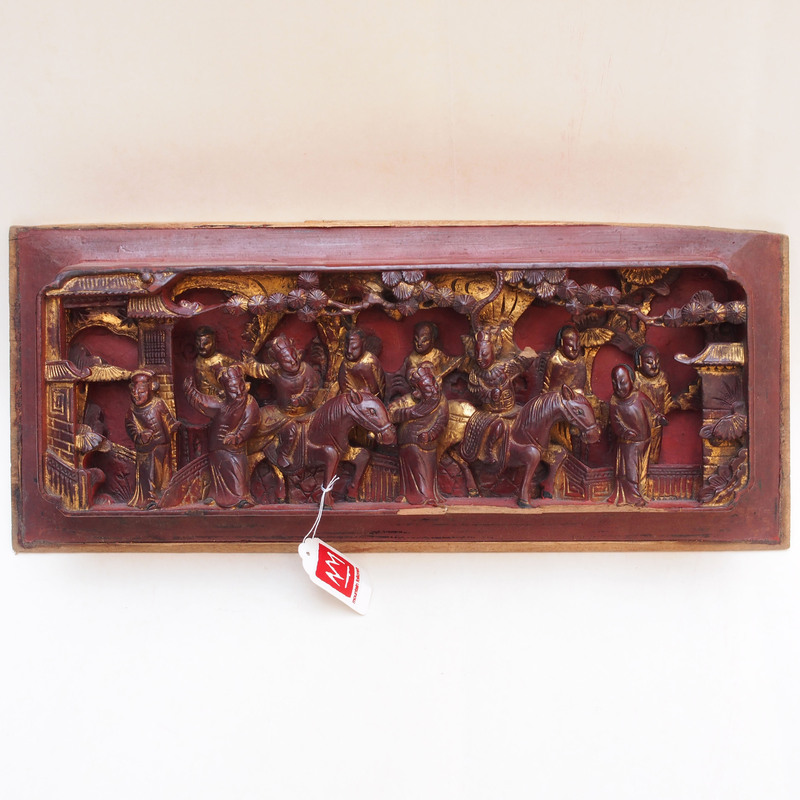 The legend dated back to the late Han dynasty, when the Wei Emperor to be was a poor farmer. One spring, when he was working in the field, he saw a immaculate carriage landed from the sky, inside of the carriage was a beautiful lady. He put away his tools and went to greet the visitor, the lady told him she is send by the Jade Emperor to be his wife, the two got married on the day, the lady saint said she has to go back to heaven and would meet him again a year later at the same place. A year later, Wei arrived early to the field awaiting for his date, the magic carriage appeared, inside it was the lady saint together with a baby. She handed him the baby and said he was his son and he will be the Emperor. The character in this golden wood carving is known as Lin Bu, a poet in the North Sung dynasty, he is surrounded by plum blossoms and there is a crane by his side. Lin led a hermetic life on a small hill at the West Lake in Huangzhou, never setting foot in the city, he found company with the monks whom he would visit with his small boat. Lin also admire plum blossoms which he planted around his hut, this also inspired him to write poems about them. Lin also kept a couple of cranes for company. It is said that if he got unexpected guests visiting while he is out on his boat, the cranes would flew to him, hoover above his boat and gave him his message. Lin was never married, the plum blossom being his wife and the crane his sons, this phrase 梅妻鶴子 (Mei Qi He Zi) became a description for a hermetic life. 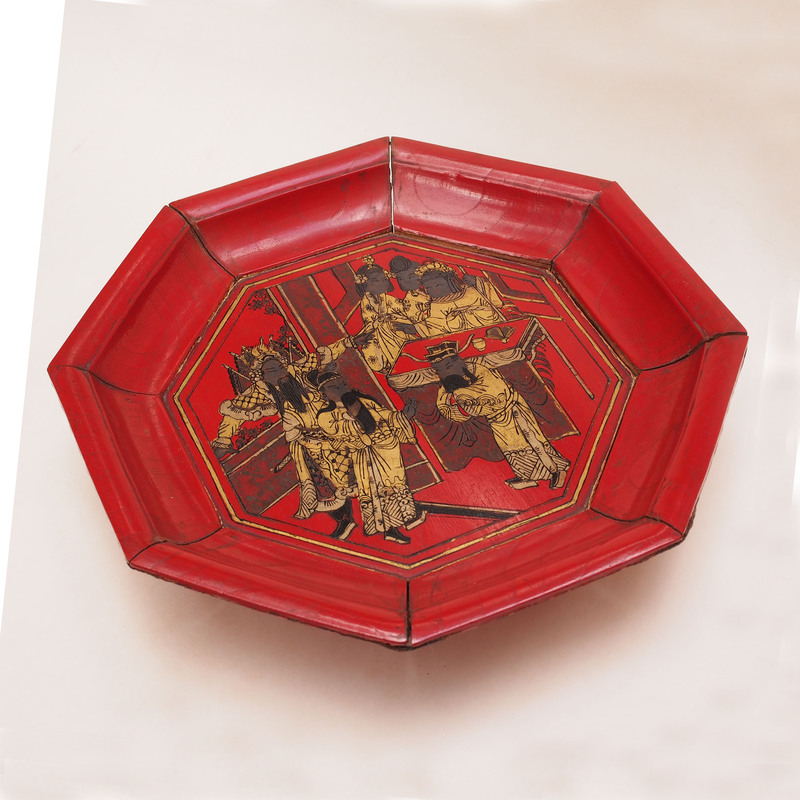 A lacquer tray decorated with picture of a scene from the Beijing opera “Tai Jun Ci Cao”. The story is about the famous Yang family of warriors. First some background to the story; Commander Lord Yang, his wife She Sai Hua and their 7 sons was defending the North Han country against the Sung. Though the Sung army is the stronger one, the Yang’s family out smarted them, the Sung General Pan was shot by Lady’s She’s arrow and had to retreat. Failing with the attack, the Sung emperor spread rumors about Lord Yang which had the suspicious North Han emperor distrust Yang’s advice and was defeated utterly. After the victory, the Sung emperor took Lord Yang under his wing and made him a trusted official, General Pan was very jealous of this promotion. The Liao country start attacking Sung, Lord Yang and his sons was defending Sung at the border. Yang’s army was out numbered, 3 of his sons were killed in action, he send his 7th son to get reinforcement but was secretly killed by Pan. Lord Yang was captured and one of his son was captured, Lord Yong committed suicide to avoid being used as a hostage while his son was selected by the Liao Princess to be her husband. The 5th son was tired of all the fighting and the politics became a monk. The 6th son managed to escape and returned to the Sung capital and became the commander in place of his father but was later killed in action. 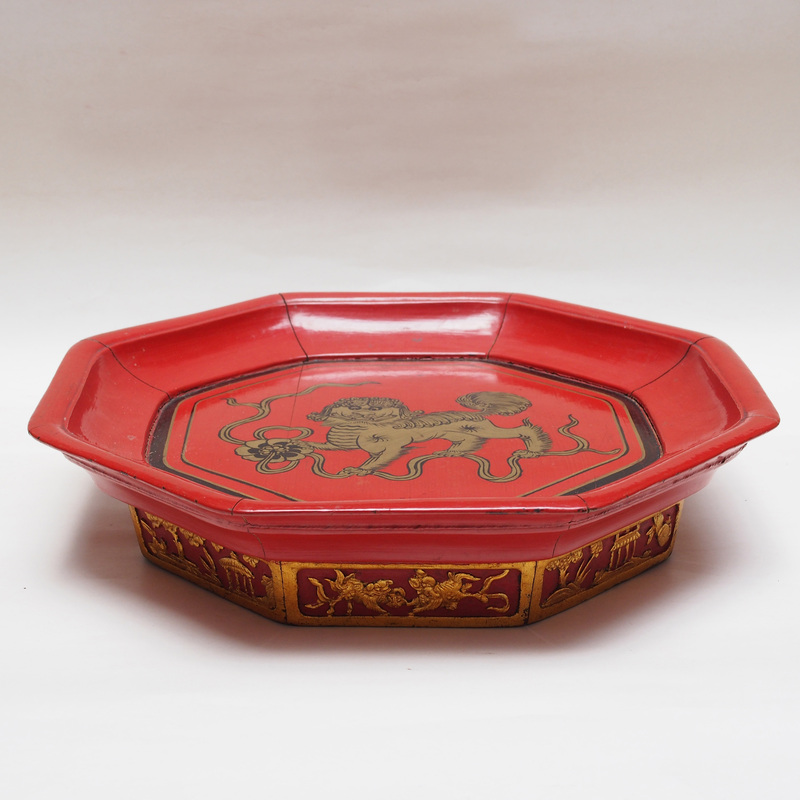 The opera story on the lacquer dish appear at this point, the Sung emperor asked the Yang family to led the fight with the Liao. With all the males gone, here is only Lady She (now in her 70s), 2 daughters, the daughter in laws and young grandson left in the family. Lady She, the commander with the female warriors led the army to victory. When they return safety home, Lady She after losing all her sons fearing that her only grandson too would eventually die in battle ask the Emperor to allow the family to leave their duty as the commanders.